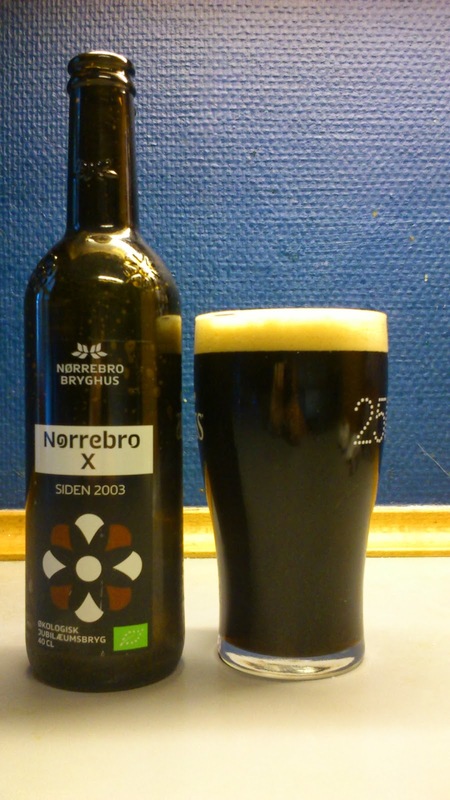 X - To celebrate Nørrebro Bryghus's 10th anniversary we have created this celebration brew that is refreshing, but also complex 6.5% dark milk ale (eh? )with a light smoked aroma that blends in harmony with the notes of vanilla. The smell is spiced from dry hopping with a background notes from the dark malts. Light wafts of roasted malt, vanilla, dark dried fruit and baby milk powder from the pour. X pours black with a creamy beige head. Baby milk powder(or I could just say lactose) and slightly sweet intake with roasted malt, dark chocolate and a touch of spice. Fruity and very lightly smoked finish with blackcurrant and raisins and a dab of eucalyptus ? in the long aftertaste. Low carbonation and the mouthfeel is silky and light creamy. To be honest and fair I am all over the place with this one as I think my tastebuds have gone haywire and the above may possibly be way off the mark. I still enjoyed it though, ain't that the main thing ? Very fruity for a stout/porter, almost to the point of saying more like a christmas brew/winter warmer. Not one I will re-visit any time soon but no problem drinking another if offered. This scored 7/10 on the ' I've made up enough baby milk bottles in my lifetime to know that smell..do you get organic milk powder ?' Beerometer. Where to buy CPH : Bought in Irma.